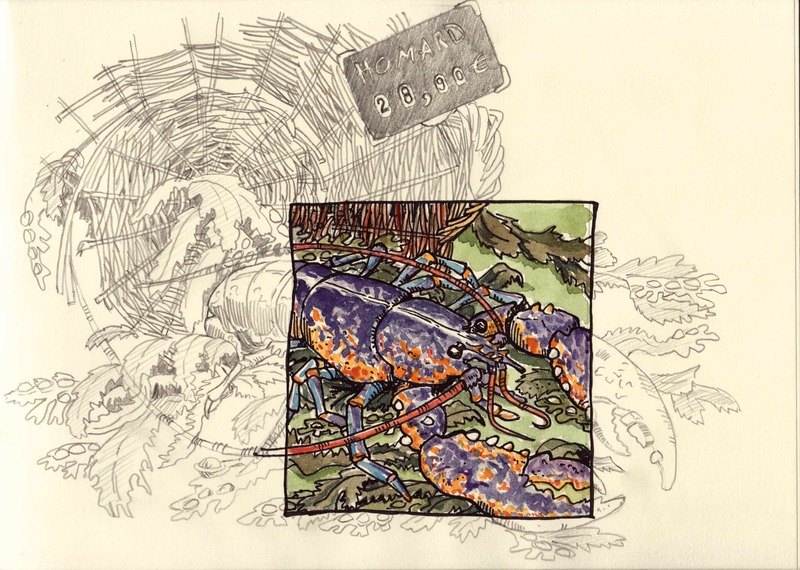 This entry was posted in aquarelle, Bretagne, Brittany, cookbook, Cooking, Cuisine, ink & watercolor, watercolor and tagged Aquarelle, Carnet de voyage, cooking, Drawing, illustration, lobster, Travel Sketch by flinflins. Bookmark the permalink. You came in Brittany and dońt visit us? What a shame!!! So, I would explain you the big différence between a lobster and a lobster. I understand you’ d prefer to tell a story about IT than really eat it. And it is the reason why you celebrate thé Blue Lobster. But local people will say to you that english is a poor language regarding lobster. And the reality holds in two different words, more, IN two concepts : le homard et la langouste. And if you want seem to be a poet, give Blue eyes to your langouste, but don’t Forget to taste it rather than your Blue homard!!! Since i married a Breton, there is no way i can be confused between a lobster and a lobster, really. But i agree, that, as far as gastronomy is concerned, english is a poor language.